A primary source is an audio, visual, or printed document created by participants or witnesses to history. Primary sources include newspapers, diaries, photographs, legislative records, laws, census data, and sound recordings. Artifacts such as quilts, dolls, and household items are also primary sources. Primary sources help students of history understand how historical figures understood their surroundings and day-to-day life. They are often discussed in comparison to secondary sources such as textbooks, which analyze many primary sources in order to create a cohesive picture of history. This page contains a sampling of primary sources relating to women’s history in Montana. For educators wanting to teach primary sources in the classroom, check out our educational resources page. The Montana State Library’s “Women in Montana” project highlights the accomplishments and experiences of Montana women to commemorate the 100th anniversary of women’s suffrage in Montana. This selection of primary sources includes government documents such as materials created for the 1972 Constitutional Convention and items such as The Montana Equal Employment Opportunity and Affirmative Action Program. See the full list of available documents by clicking here. The Library of Congress and the National Endowment for the Humanities started Chronicling America in an effort to digitize, preserve, and provide access to American newspapers. 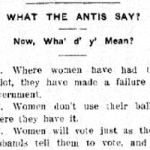 They have digitized many Montana newspapers, including the Suffrage Daily News, a bulletin produced by the Montana Equal Suffrage State Central Committee in 1914. Even more Montana newspapers have been digitized on Montana Newspapers. The Montana Memory Project provides access to digital collections and items relating to Montana’s cultural heritage and government. In part, these collections and items document the Montana experience. Access is free and open through the Internet. Many of these items are digitized copies of historic material; some items are contemporary. All serve as a resource for education, business, pleasure, and lifelong learning. This project is a statewide project of the Montana State Library in partnership with the Montana Historical Society Research Center. The Montana Memory Project includes many items of particular interest to those who study women’s history. The following is just a sample of available resources. Other cook books, such as the Round-up Cook Book (1913) produced by the Ladies’ social circle of First Presbyterian Church in Miles City, reflect the tight-knit nature of communities bound by shared ideals. You can find these and other cookbooks in the Montana Memory Cookbook Collection. Letters and diaries reveal much about the lives of early Montana settlers such as pioneer photographer Evelyn Cameron, whose diaries span from 1893 to 1928. 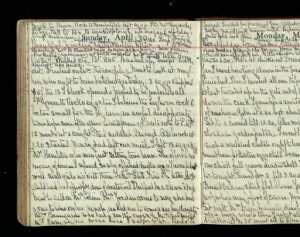 Hester Ferguson Henshall, an early naturalist, kept a journal of her trip through Yellowstone National Park in 1903 or 1904. Flora Wong exchanged letters with her husband, detailing their details in getting her exit papers from China c in 1948. Grace Marron Gilmore, a Dawson County rancher, sent an illustrated letter to a friend. Letters and diaries provide a profoundly personal insight into women’s experiences in Montana. Find the military records of women such as Doris Brander, who enlisted in the WAVES and committed herself to honoring the service of women veterans. Photo courtesy of Linda Brander. This digital collection is comprised of State of Montana enlistment cards for the Montana National Guard from 1890 to 1918 and from 1939 to 1945 and is arranged alphabetically by surname. It includes enlistment information for everyone who entered the service in Montana during this period, including Spanish-American War, pre-World War I enlistments, as well as enlistments during World War I and World War II records. 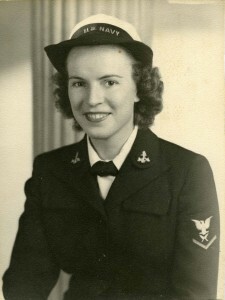 The Montana Historical Society Research Center has created directions for finding women in these military enlistment records, including nurses and World War II service women. The physical collection consists of records of the Montana State Prison (1869-1974), the Board of Pardons (1890-1965), the Board of Prison Commissioners (1890-1962), and the United States Penitentiary, Montana Territory. 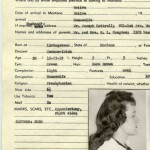 This digital collection will ultimately comprise approximately ten thousand prisoner description sheets with mug shots. Post-1932 records may also include FBI arrest sheets. Women committed many types of crimes, from grand larceny to murder. To filter results to find women prisoners, search “female” and then search again “within results” for crimes such as “prostitution,” “manslaughter,” or “forgery.” The records can also be searched by county, national origin, and place of residence. Want to learn more about women in the Montana prison system? Check out this blog post! Rosetta Kamlowsky was one of the first female broadcasters in Montana. She hosted the Scooter radio show on KBLL Radio beginning in 1968. Over the course of her broadcasting career she interviewed everyone from her local friends and neighbors to Montana governors and Hollywood celebrities. This is a collection of those interviews dating from the 1960s to the 1980s.